37%. Spent $143, saved $85. Once again, Shop Rite was out of some items, and either they or I totally forgot the deli order, so I should have spent more. 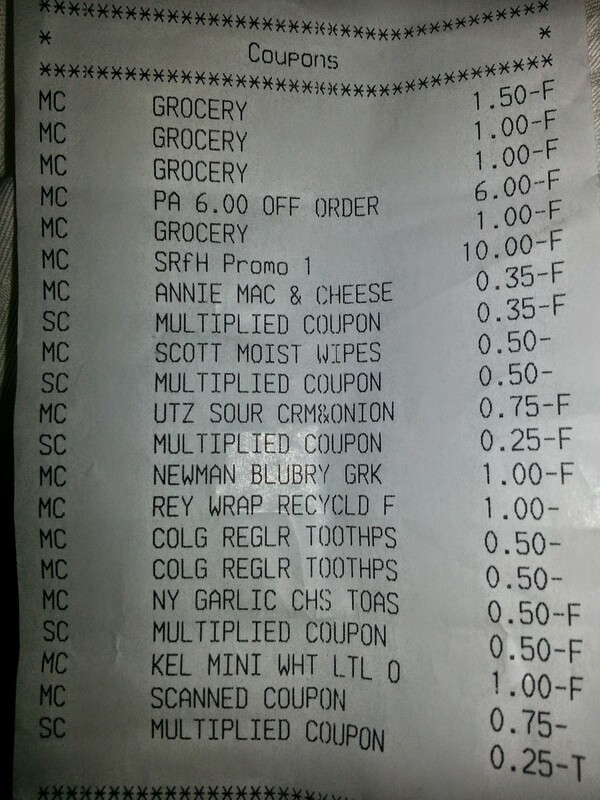 According to the Shop Rite Couponers FB group, it’s a good couponing week with lots of deals. I guess that’s why I was on the computer placing my order and printing coupons from about 7 pm through 10 pm Sunday night. I had spent the day at the beach with the kids, so the husband took over kid duty when we got home. My best deals were a pint of Ben & Jerry’s for $1; Colgate toothpaste for $1; Turkey Hill ice cream (what I still call a half-gallon, but which is actually 48 oz) for $1; Newman’s Own Greek yogurt, three 5.3 oz containers, for $1; Purex detergent for $1.88; Annie’s Organic mac n cheese for 90 cents; and Utz potato chips for $1. Sorry if I don’t always have the sizes for the item; I’m not in the kitchen right now. But these are standard sizes, not small or travel or anything. I earned a $5 Catalina for next time for buying certain Kellogg’s items, and I got $10 off this order for buying certain Nabisco items. A lot of those items are going into my vacation food stash. Biggest indulgence, calorically: the Ben & Jerry’s. Biggest indulgence, financially: organic blueberries. But baby girl eats the blueberries like they are candy, which makes me happy.